I remember waking up, as a child, to the wonderful aroma of bacon frying and coffee percolating. It was comforting to go padding into the warm kitchen and find my mother fussing over the first meal of the day. The table would already be set with glasses of fresh orange juice at each place, and my mother would be standing by the stove frying bacon and eggs. There would be a plate of buttered toast on the table and a jar of jam nearby. Sometimes, she’d make pancakes, waffles or oatmeal instead of eggs. 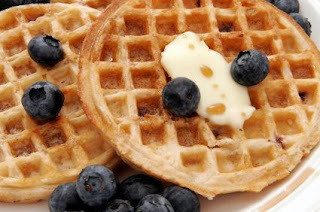 My favorite was blueberry waffles. What has happened to the family breakfast? Not only breakfast, but other meals have suffered also with the passing of time. Having been a homemaker for many years, I have no trouble creating a couple of pie crusts or a batch of biscuits from “scratch.” But today’s need for two pay checks and the advent of the working mother have left no time for learning or practicing the art of making homemade goodies. Sadly, a real waffle, to his generation, comes out of a box that is kept in the freezer. I’m not knocking frozen food. The convenience of it on a busy day is much appreciated. And I think it’s wonderful that today’s active young mothers have the very able help of Betty Crocker and Mrs. Smith. But something has been lost, to be sure. One summer day, long ago, my favorite aunt and I spent the day picking blackberries in anticipation of a big bowl of my grandmother’s cobbler, which she made while we were taking our evening baths. She covered the warm blackberry mixture with milk and, after we devoured it, she tucked two sleepy kids with warm, satisfied tummies into bed. What a wonderful memory! What kind of food related memories will today’s children carry in their hearts forever? Will they always prefer frozen waffles? I can almost taste those waffles Peggy. Um Um Good! I remember breakfasts like that when I was little.